Multi-purpose arena in Ontario, California, USA. Englekirk Partners Consulting Engineers, Inc.
Citizens Business Bank Arena (originally Ontario Community Events Center) is a multi-purpose arena in Ontario, California, USA. It hosts local sporting events and concerts. Construction officially began on March 7, 2007, and the arena was opened on October 18, 2008. It is suitable for indoor events, including basketball, ice hockey, ice shows, boxing, graduation ceremonies and concerts. The arena's basketball capacity is 10,832. It also seats 9,736 for hockey (9,491 for Ontario Reign games) and its full capacity is 11,089. The 225,000-square-foot (20,900 m2) venue also has 36 luxury suites on two levels. It is the biggest and most modern arena within the Inland Empire region of California. The arena's construction cost was $150 million; however, it was debt free due to the city selling different properties throughout the city. It was constructed on the old Ontario Motor Speedway property. The arena is owned by the city of Ontario and from 2008 to 2016 was operated by AEG Worldwide, since July 1, 2016, the arena is operated by SMG. The arena is home to the Ontario Reign of the American Hockey League, the Ontario Fury of the Major Arena Soccer League and the Agua Caliente Clippers of the NBA G League. The arena's original name was Ontario Community Events Center when the arena was first announced in October 2006. On October 20, 2006, it was announced that the city based bank, Citizens Business Bank, bought the naming right for the arena. Citizens Business Bank is the largest locally-based financial institution in the region and California's eleventh largest bank. 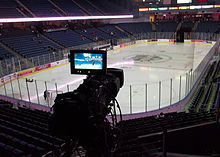 In November 2007, it was announced that a new ECHL franchise would be playing at the arena starting in the 2008–09 season. The arena became home of the Ontario Reign, an affiliate of the Los Angeles Kings. The ECHL Reign played their home games at the arena each season from 2008 to 2015. In 2012, the arena was home to the Ontario Warriors of American Indoor Football but the team folded before the season ended. Since 2013, the arena has been home of the Ontario Fury of the Major Arena Soccer League. In 2014 and 2015, the arena also hosted select home games of the Los Angeles D-Fenders. On January 29, 2015, the Los Angeles Kings announced that they would be moving their American Hockey League affiliate, the Manchester Monarchs, from Manchester, New Hampshire, to Ontario. The team retained the Ontario Reign nickname from its ECHL predecessor. The ECHL's Reign moved to Manchester, New Hampshire, and became the Monarchs. Starting in the 2017–18 season the arena became home of the Agua Caliente Clippers, the NBA G League team of the Los Angeles Clippers. The arena held its grand opening on October 18, 2008. On October 24, 2008, its first event took place in front of a sold-out crowd of 10,316, for an NBA preseason game, where the Los Angeles Lakers defeated the Oklahoma City Thunder 105–94. There has been a Lakers' preseason game every year at the arena with the exception of 2011 due to the 2011 NBA lockout. The arena was host of the inaugural games in the Junior Basketball Association on June 21, 2018, and is the host of the 2018 JBA Championship. The Reign held its first game at the arena on October 25, 2008, against the Las Vegas Wranglers in front of a crowd of 8,832. The Reign won their first game at the arena 4–1. On January 20, 2010, the arena hosted the 2010 ECHL All-Star Game in front of 7,615 fans. The arena also hosted a preseason match between the Los Angeles Kings and the San Jose Sharks. Carrie Underwood played the arena's first concert on November 9, 2008, with Little Big Town as her opening act. American heavy metal band Metallica performed at the arena during their World Magnetic Tour on December 12, 2008, in front of a crowd of 10,959 and filmed part of their music video Broken, Beat & Scarred during the concert and also at the concert at the Save Mart Center in Fresno, California, on December 13, 2008. The arena has also hosted Bill Gaither, Larry the Cable Guy, Vicente Fernández, Sade, Justin Bieber, Earth, Wind & Fire, Chicago, Elton John, The Eagles, Disney on Ice, Playhouse Disney Live, Sesame Street Live, The Harlem Globetrotters, Bob Dylan, Scorpions, Neil Diamond, André Rieu, American Idol Live!, Trace Adkins, Alan Jackson, Pitbull, Dancing With the Stars, Stars on Ice, Ringling Bros. and Barnum & Bailey Circus, and other events. On September 1, 2013, the arena was the site where Mexican singers Joan Sebastian and Ezequiel Peña sang together for the first time ever. The American Idols LIVE! Tour 2011 was held on July 16, 2011. English singer Sade recorded her Bring Me Home Live 2011 DVD at the arena on September 4, 2011. On October 29, 2012, Katy Perry did a private concert at the arena for the San Manuel Indian Tribe. During her Blown Away Tour, country music singer Carrie Underwood filmed The Blown Away Tour: Live DVD at the arena on March 3, 2013, the concert also aired live on AXS TV. During the summer of 2013, Selena Gomez used the arena to rehearse for her Stars Dance Tour. On July 5, 2014, Cher did a stop here on her Dressed to Kill Tour with her very special guest Cyndi Lauper. Since its opening, the arena has hosted many boxing events. The first boxing event was on November 28, 2008, with two fights, Chris Arreola vs. Travis Walker and Paul Williams vs. Verno Phillips. On December 5, 2009, the arena hosted a women's title fight between champion Kina Malpartida and Lyndsey Scragg. On April 24, 2010, the arena was the venue where Tomasz Adamek defeated Chris Arreola to retain the IBF International Heavyweight Title. The arena also hosted an ESPN Friday Night Fights event on July 2, 2010, with the main event being Demetrius Hopkins vs. Mike Arnaoutis. On August 13, 2010, Friday Night Fights returned to the arena with a fight between Chris Arreola and Manuel Quezada. On July 14, 2012, Mexican female boxer Mariana "La Barbie" Juarez defended her Flyweight title against Japanese boxer Shindo Go; the bout was broadcast on Mexican channel Televisa Canal 5 series Sábados de Corona. On November 24, 2012, Robert Guerrero successfully defended his interim WBC Welterweight title against Andre Berto at the arena. The arena hosted Andre Ward vs Edwin Rodríguez on November 16, 2013. On March 13, 2015, the first PBC on Spike event was held at the venue with main event being Andre Berto vs Josesito López. Since 2010, the arena has been the Inland Empire's stop for WWE, replacing the smaller Coussoulis Arena in San Bernardino. The arena has hosted various WWE Live events and various tapings for WWE Raw and SmackDown. The Smackdown/Main Event tapings on February 11, 2014 were the first time WWE televised an event from the Inland Empire since they taped four editions of WWE Raw at the Orange Pavilion in San Bernardino on April 1, 1996. The arena has also been host to many Mixed martial arts events including Bellator Fighting Championships. On August 10, 2013, the arena hosted WSOF 4: Spong vs. DeAnda. The arena also hosts various events of MMA promotion King of the Cage, which has its headquarters in nearby Rancho Cucamonga. From 2014 to 2017, the arena hosted the annual CIF Southern Section Boys Masters Wrestling Championships. In 2018 the event was also scheduled to be held at the arena but was moved to Temecula Valley High School, where the event was previously held, due to scheduling conflicts. The venue hosted a PBR Built Ford Tough Series bull riding event in late September 2009 and also hosted another event on August 29 and August 30, 2010. The arena was the site of the 2011 edition of Skate America from October 21 to the 23rd. The arena is used for high school graduation ceremonies from the Fontana Unified School District, the Rialto Unified School District, the Chino Valley Unified School District and the Upland Unified School District in late May/early June. ^ a b c d e f g h "FACTS ABOUT CITIZENS BUSINESS BANK ARENA". Retrieved February 22, 2018. 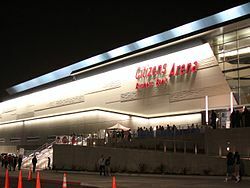 ^ a b "SMG to Manage Citizens Business Bank Arena; Will Ontario Reign Remain?". arenadigest.com. Retrieved June 30, 2016. ^ "Professional Arena Soccer League Coming to Citizens Business Bank Arena". PASL Soccer. September 3, 2013. Retrieved September 3, 2013. ^ a b "Citizens Business Bank Arena". ICON Venue Group. October 15, 2008. Retrieved November 3, 2011. ^ "Other Projects Wrapping Up This Year". SportsBusiness Journal. January 21, 2008. Retrieved November 3, 2011. ^ Franko, Vanessa; Pierceall, Kimberly (October 13, 2008). "Ontario's New Arena". The Press-Enterprise. Riverside. Archived from the original on August 17, 2010. Retrieved January 13, 2009. ^ Wener, Ben (November 7, 2008). "New Ontario Arena Gears Up for Concerts". Orange County Register. Retrieved January 13, 2009. ^ "AEG Worldwide". Anschutz Entertainment Group. Retrieved January 13, 2009. ^ "Arena Announcement". City of Ontario. October 2, 2006. Retrieved January 13, 2009. ^ a b "Arena Faqs". Citizens Business Bank Arena. Retrieved October 31, 2011. ^ Shikes, Jonathan (March 18, 2007). "Ontario's Citizens Business Bank Faces More Competition As It Grows". The Press-Enterprise. Riverside. Archived from the original on October 22, 2012. Retrieved January 13, 2009. ^ "Pro Hockey Invades the Inland Empire". Ontario Reign. November 16, 2007. Retrieved January 13, 2009. ^ "Ontario Set To Reign The Inland Empire". Ontario Reign. December 12, 2007. Retrieved January 13, 2009. ^ "Reign Faqs". Ontario Reign. Retrieved January 13, 2009. ^ Segal, Shel (February 12, 2012). "Ontario Warriors Will Begin Professional Football Competition Next Month; Team President Says: 'We Guarantee We'll Win the Championship'". Fontana Herald News. Retrieved February 15, 2012. ^ "Reign Become the AHL Affiliate of LA Kings". Ontario Reign. January 30, 2015. Retrieved January 31, 2015. ^ "Grand Opening Celebration". Citizens Business Bank Arena. Retrieved September 16, 2008. ^ "Kobe Plays Fewer Than 8 Minutes, but Helps Lakers to Strong Start". ESPN. Associated Press. October 24, 2008. Retrieved October 31, 2011. ^ "Reign Lasso In Wranglers With A 4-1 Win In Home Opener". Ontario Reign. October 25, 2008. Retrieved November 2, 2008. ^ Knoblauch, Austin (August 28, 2009). "Ontario Reign to Host ECHL All-Star Game in January [UPDATED]". Los Angeles Times. Retrieved October 31, 2011. ^ "Sharks 2, Kings 1, SO". National Hockey League. September 23, 2009. Retrieved October 31, 2011. ^ "Carrie Underwood". Citizens Business Bank Arena. Retrieved September 16, 2008. ^ "Concert Box Score 2004-2010 Metallica". Marksaw.com. Retrieved November 3, 2011. ^ "Blabbermouth.net - Metallica: Release Date Announced For French Concert DVD". RoadRunner Records. Retrieved November 3, 2011. ^ "Arena Previous events". Citizens Business Bank Arena. Retrieved July 6, 2010. ^ "Carrie Underwood Concert DVD Due Aug. 13". CMT.com. September 3, 2013. Retrieved September 3, 2013. ^ Aguilar, Nathan (November 25, 2008). "Paul Williams vs Verno Phillips and Chris Arreola vs Travis Walker: On HBO". Bleacher Report. Retrieved July 6, 2010. ^ Avila, David A. (December 2, 2009). "Peru's National Hero Kina Malpartida Defends Title". The Sweet Science. Retrieved July 6, 2010. ^ "Adamek Wins Majority Decision Over Arreola". ESPN. Associated Press. April 25, 2010. Retrieved July 6, 2010. ^ "Demetrius Hopkins Wins Fight, Contreras Wins Too". The Sweet Science. July 3, 2010. Retrieved July 6, 2010. ^ Rafael, Dan (July 6, 2010). "Arreola to Face Quezada on Aug. 13". ESPN. Retrieved July 6, 2010. ^ "Ovëishon Presents Three World Boxing Championships Sanctioned by the WBC at the Citizens Business Bank Arena". Citizens Business Bank Arena. June 25, 2012. Retrieved October 29, 2012. ^ Pugmire, Lance (October 23, 2012). "Andre Berto, Robert Guerrero to Fight Nov. 24 in Ontario". Los Angeles Times. Retrieved October 29, 2012. ^ "WWE Supershow House Show Results (12/05/10) - Ontario, California". Wrestling News World. December 5, 2010. Retrieved October 30, 2011. ^ "2/25 WWE Results Ontario, Calif.: Punk Defends WWE Title in Three-Way Main Event, Eve Promo & Miz Backs Eve, Funk is Back Night 2". PWTorch. February 25, 2010. Retrieved March 12, 2012. ^ "Update On Undertaker's In-Ring Future, WWE Interested In ROH Talents, Recent Attendance". Wrestling Inc. February 29, 2012. Retrieved March 12, 2009. ^ "WWE SmackDown Ontario". WWE. November 22, 2013. Retrieved November 22, 2013. ^ "WWE SMACKDOWN COMES TO THE Inland Empire on FEBRUARY 11, 2014". CBBankArena.com. November 22, 2013. Retrieved November 22, 2013. ^ "PBR Heads West for Dickies Invitational in Ontario, California". Professional Bull Riders. September 1, 2009. Retrieved October 30, 2011. ^ "Ontario, Calif., Selected to host 2011 Skate America". Citizens Business Bank Arena. March 3, 2011. Retrieved October 31, 2011. Wikimedia Commons has media related to Citizens Business Bank Arena.